Between professional travelers and the people who prefer to stay close to home, Dave and I, passionate as we are about experiencing new places and cultures, have not built our work life to accommodate more than a couple of trips a year, and so each departure feels fresh, an adventure, some of them more scary and daring than others. Once, on a Greek island of Naxos, we met a French couple with a three-week old baby. The two of them worked for Doctors Without Borders, and never got a chance to spend enough time together. After their baby was born, instead of staying in their hometown, surrounded by well-meaning family and friends, they decided to take the baby to a quiet relaxing place where the three of them would have a chance to bond. These professional travelers thought nothing, nay, found it relaxing, to take their newborn to a small island, accessible by ferry only in calm seas (the ferry we arrived on was able to dock at the port on the third attempt, just barely) and by a small aircraft, equally dependent on weather. At that time, Dave and I were only thinking about thinking about having a baby, and we put this story away as something both thrilling and worth aspiring to. 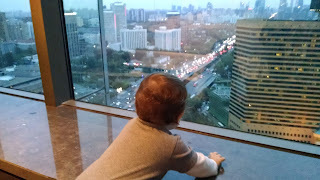 I'm writing this from Beijing, where the nearly eleven-month Bowie and I landed yesterday, to rejoin Dave. Dave's been traveling to China for work; this time, he's helping to organize the company's annual conference happening next week. He's been here for a few days already to see things through (here are his photos from the past week). Bowie and I couldn't miss this chance to watch him do his job magic and to assist by breaking his sleep into bite-size chunks (tastier this way?). We also have our sights set on the following week, when Dave will take a vacation and we head to Tokyo. So far, we've done little more than arrive, take a brief survey of the hotel and the nearby malls, fall asleep at dinner (Bowie), take a two o'clock in the morning snack of the dinner leftovers (Bowie), have breakfast and take a midday nap (Bowie). I'm hanging out now waiting for an appropriate time to wake Bowie from the nap (jet lag baby!) so that we could try out the perfect indoor playground area Dave had scouted out for us. Here's the thing I love the most about traveling with Bowie so far: the baby knows how to make friends. In the airport and during the flight, he worked the system better than a priority status. 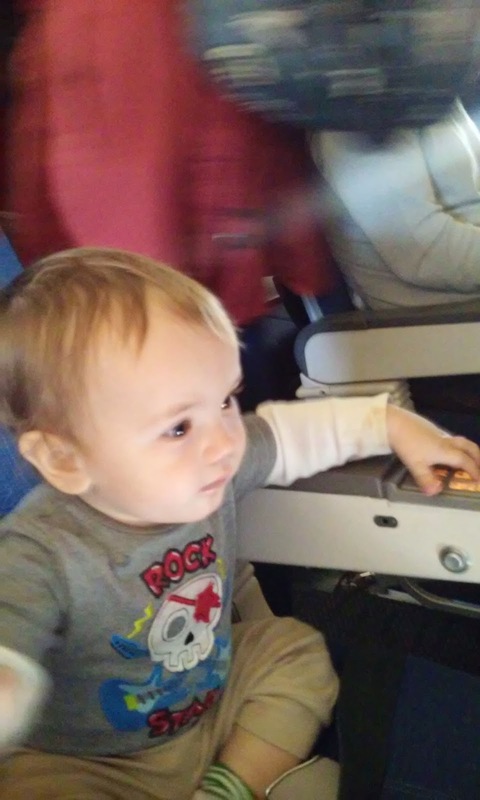 We got seated early and, since the aircraft wasn't completely full, the flight attendants moved the man seated next to us, allowing Bowie extra room to crawl and play. A tireless neighbor behind us spent at least an hour playing peekaboo with Bowie; another neighbor used her fingers to teach him Chinese numbers. Bowie then counted individual grains of rice served to us for dinner--a few did end up in his mouth. And hey, those baby changing stations on the Boeings? Quite functional with plenty of counter space with entertainment for the busy crawler. From the paper cups and paper towels to the faucet and the mirror, it's all a curiosity to him. Speaking of entertainment, while waiting on that clean diaper, peeing all over that changing station seems just the thing to do! Sounds like all is going really well! This last shot reminds me of the scenes of ScarJo holed up in the Tokyo hotel in Lost in Translation. I wonder what is gained in translation to pre-verbal baby language. It sounds like Bowie had a good flight. But when did his mom sleep? Awesome back story! Great blog entry! 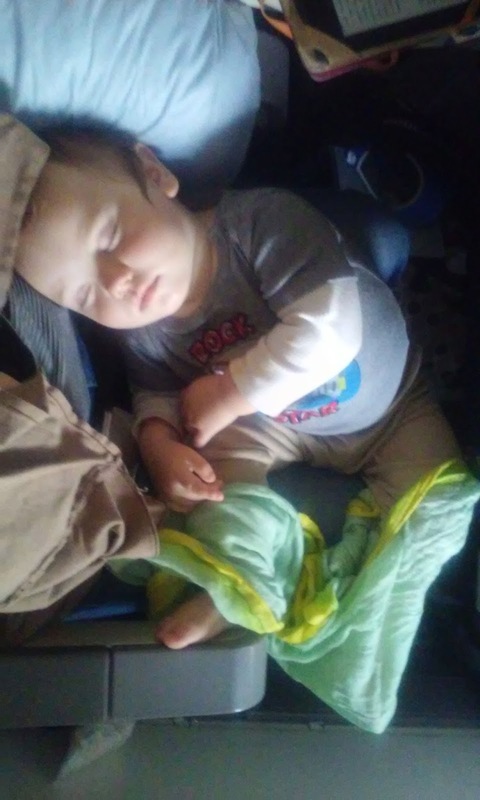 glad it was a good flight! We used to get some horrified looks getting on with baby (whether one, two, three or four) and I would say "Don't worry, the baby is usually better behaved than the grown ups" broke the ice-- and it was true!